Sen. Susan Collins will have to cast her vote on the tax bill without knowing for certain that commitments made to her will be honored, leading critics to say she’s getting played for a fool. WASHINGTON — As GOP tax legislation nears final passage, Sen. Susan Collins is approaching the moment for a mighty leap of faith. The Maine Republican extracted key concessions in exchange for her support for the bill, including commitments from the Trump administration and Senate leaders to back two pieces of legislation pumping money into the health care system. The problem is, House Republicans largely oppose the health care bills. And while Collins anticipates the commitments will be included in must-pass spending legislation to keep the government open, the tax package is scheduled for a final passage vote next week, before the spending measure comes up for a vote. That means Collins will have to cast her vote on the tax bill without knowing for certain that commitments made to her will be honored, leading critics to say she’s getting played for a fool. Indeed, with the fourth-term senator poised to play an even more pivotal role in the Senate next year, she might be among the last people President Donald Trump or Majority Leader Mitch McConnell, R-Ky., wants to alienate. One of the few remaining moderate Republicans in the Senate, Collins, 65, has repeatedly used her vote to sway outcomes and shape the debate on issues from nominations to health care to the environment. She passed up a run for Maine governor this year although she would have been the instant front-runner, saying she believed her influence was best wielded from the Senate floor. Because of the upset win by Democrat Doug Jones in a special Senate election in Alabama on Tuesday, the GOP’s already slim 52-48 Senate majority will dwindle to 51-49 next year. That will give Collins a pivotal role in every legislative fight for the remainder of Trump’s first term and beyond. Collins, Murkowski and Sen. John McCain, R-Ariz., were the three Republicans who killed the GOP’s efforts to repeal the Affordable Care Act this year, despite seven years of their party’s promises to undo the Obama era achievement. When she returned home to Maine after casting that pivotal vote, passengers in the Bangor airport applauded when she stepped off her plane. The reaction at home to her stance on the tax legislation has been different. The tax bill, which increases the deficit while delivering huge benefits to corporations and the wealthy, polls poorly and has sparked repeated protests against Collins. Students have staged sit-ins while religious leaders were arrested after occupying one of her offices. After Collins’ votes against the Obamacare repeal, some Maine residents have struggled to understand why she would support a tax bill that slashes corporate rates while repealing the Affordable Care Act’s mandate for most Americans to carry health insurance or pay fines. Using a tax penalty to require people to purchase insurance is meant to ensure that both sick and healthy people sign up for coverage, holding down premiums for all by insuring healthy people with low costs to balance the cost of insuring sick people whose care costs more. The individual-mandate repeal is expected to result in 13 million more uninsured Americans, and health care advocates say that even if they do end up becoming law, the health bills Collins supports will not make up for that. “It’s the last vote that counts. You can say ‘no’ 53 times in a row but if the 54th is the ‘yes’ that puts the thing over the line, that’s going to be your legacy,” said Steve Butterfield, policy director of Consumers for Affordable Health Care in Augusta, Maine. He said Collins’ legacy would be millions of Americans losing their health insurance. “It’s absolutely unbelievable,” he said. 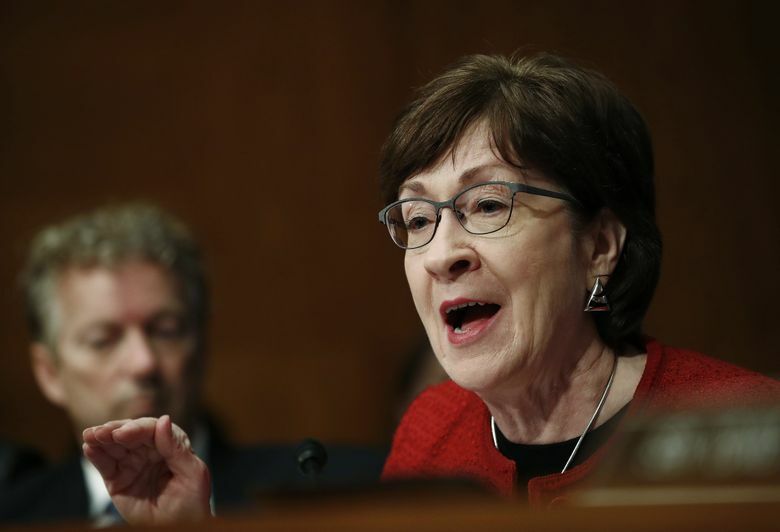 Collins said she has never liked the individual mandate, because it forces consumers to buy a product they may not want, and the fines on abstainers fall disproportionately on people who make less than $50,000 a year. She draws a distinction between the individual-mandate repeal in the tax legislation, and the earlier GOP health bills that she opposed, which in addition to the mandate repeal also kicked millions of people off Medicaid, among other changes. Nonetheless, Collins opposed including the mandate repeal in the tax legislation, saying the issues should be addressed separately. Once GOP leaders decided to include it, partly because it raised nearly $340 billion in revenue they could use to lower taxes for corporations and make other changes, Collins began arguing that other health care legislation would be needed to stabilize insurance markets and keep premiums from spiking. The Congressional Budget Office (CBO) estimated that the individual-mandate repeal would lead to premiums rising 10 percent in the individual insurance market. One of the bills Collins supports, authored by Sens. Lamar Alexander, R-Tenn., and Patty Murray, D-Wash., restores so-called cost-sharing reduction payments that help insurers reduce costs for lower-income Americans under the Affordable Care Act. Congressional Republicans had challenged the federal payments in court during, and Trump decided in October to stop making them. The other bill Collins co-authored with Sen. Bill Nelson, D-Fla., to create a $10 billion “reinsurance” program that states could draw on over two years to set up high-risk pools that lower costs for patients who are particularly hard to insure. In addition to pushing for the health care bills Collins negotiated several other changes to the tax legislation, including preserving taxpayers’ ability to deduct medical expenses, and allowing them to deduct up to $10,000 in state and local taxes from their federal tax bill. Those changes were included in the tax legislation itself, instead of relying on the promise of future action by Congress. Collins’ moves on the health bills have been met with skepticism if not downright ridicule from critics who note that she has already backed off her call for the health legislation to pass before the tax bill. Instead, she now says the health bills must pass by the end of this year, pointing to a written pledge from McConnell and to oral commitments from administration officials, including Vice President Mike Pence and Trump himself. Some Democrats argue those promises will not amount to much.